Jimmy Henderson II Construction Company, Inc. offers both custom and spec homes to its valued customers that will meet both your budget and lifestyle needs. 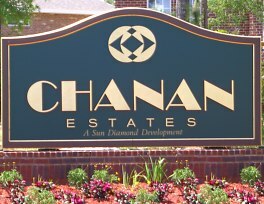 Chanan Estates is a premier Crestview development south of interstate 10, making it very accessible to both Eglin AFB and the beaches. We have built several award winning homes in this neighborhood and it's no wonder why after taking a drive through gates. Chanan's uniqueness is a combination of outstanding location, natural precincts, superb architecture, quality craftmanship, covenants safeguards, family friendliness, and attractive pricing. Its layout has been carefully planned to feature leisurely sidewalks, palm tree landscapes, affable cul-de-sacs with specially designed street signs, coordinated mailboxes and yard lights. Whether as a home or an investment, Chanan Estates offers a real asset of choice and value. Currently, we have four homes available for sale. View the land plot of the entire development on-line along with the lot availability to select the location for your dream home. This new 5 bedroom townhome in the Heart of Fort Walton Beach is convenient to Eglin Air Force Base and Hurlburt Field. Light and Bright kitchen with Granite counter tops with 4'' Backsplash, Kenmore Stainless Steel appliances, breakfast bar and pantry. Dining area that adjoins kitchen. Downstairs Master Suite with walk-in closet, dual vanities, separate shower, and garden tub.